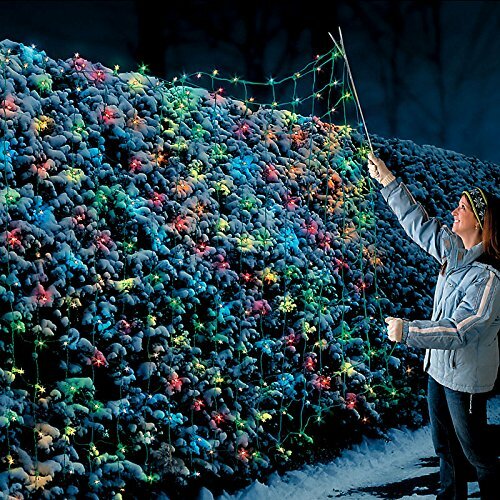 Large net lets you easily cover bushes and shrubs with 300 evenly-spaced lights. An end-to-end connection allows you to connect the LED Net Lights with additional sets or your other lighted decor. These outdoor Christmas lights use less energy than incandescent lights, plus they shine brighter and last longer. With LED Net Lights, you'll save on power and enjoy vivid color for years! Net Lights feature 300 evenly-spaced lights to create a dazzling display. LED outdoor Christmas lights use less energy than incandescent lights. You can also wrap the Christmas Net Lights around a big tree, or use them to cover a large picture window. Net Lights fold up easily and tangle-free for storage.